In the summer, walking your dog can be paradise. It’s fun, it’s easy, and your dog gets plenty of exercise. As the weather gets colder, however, walking your dog can be a chore. As the temperature drops, it’s time to start thinking about how you’re going to keep your pet healthy as snow impedes the daily walk. It’s important to understand that dogs, like people, need to be properly geared up for the weather. Now, we’re not saying that you need to rush out and get your pooch a parka (though those are kind of cute). Your pet’s tolerance to the cold is unique. 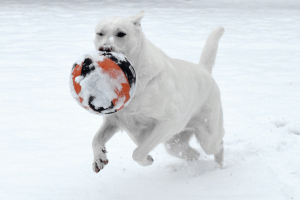 Depending on the breed, health, and special needs of your best friend strolls throughout a winter wonderland may or may not be in their best interest. Some short haired dogs will even avoid going outdoors at all costs. That is where Hustlin’ Hounds comes in. We understand that every situation is different. We will walk your dog in any weather—rain, snow, or sleet. Instead of suffering through the winter trying to give your dog some exercise, give us a call. We’re even happy to provide your pet that loving affection they crave, indoors too!